[135 Pages Report] The automotive power distribution block market was valued at USD 6.29 billion in 2017 and is projected to reach USD 8.60 billion by 2025, growing at a CAGR of 4.15% during the forecast period. The base year for the report is 2017 and the forecast period is 2018 to 2025. The research methodology used in the report involves primary and secondary sources and follows a bottom-up approach for the purpose of data triangulation. The study involves the country-level OEM and model-wise analysis of automotive power distribution block market. This analysis involves historical trends as well as existing penetrations by country as well as vehicle type. The analysis is projected based on various factors such as growth trends in vehicle production and adoption rate of automotive power distribution block by OEMs. The analysis has been discussed and validated by primary respondents, which include experts from the automotive industry, manufacturers, and suppliers. Secondary sources include associations such as China Association of Automobile Manufacturers (CAAM), International Organization of Motor Vehicle Manufacturers (OICA), European Automobile Manufacturers Association (ACEA), Society of Indian Automobile Manufacturers (SIAM), SAE International, and paid databases and directories such as Factiva. 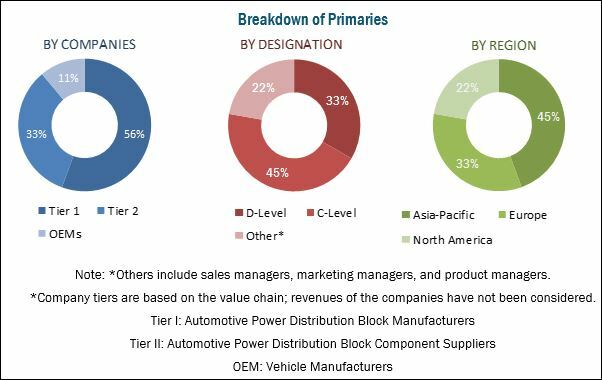 The ecosystem of the automotive power distribution block market consists of automotive power distribution block manufacturers such as Eaton (Ireland), Lear (US), Sumitomo Electric (Japan), TE Connectivity (Switzerland), Yazaki (Japan), and Littelfuse (US). The adoption of electronic content in vehicles has increased rapidly in the last two decades. The pace is poised to accelerate further. Further, the adoption of advanced electronics in smart vehicles would enable vehicle users to use features such as in-car payment services, on-road entertainment, connected services, etc. The increasing consumer preference for these features is a major driving force for the growth of the electronic cockpit systems. Moreover, stringent safety norms imposed by governments and legislative agencies have forced automobile manufacturers to make vehicles safer by providing features such as anti-lock braking systems (ABS), electronic brake-force distribution (EBD), telematics, adaptive lighting, and airbags. These safety features rely heavily on inputs from electronic control units. A hardwired power distribution box uses traditional power transmission components such as fuses, relays, connectors, wires, etc. This type of power distribution box is widely used in the vehicle power distribution market, particularly in the Asia Pacific region. The passenger car market in developing economies such as China, Brazil, and India has a large market share of this type of power distribution box. Also, the hardwired power distribution box is widely used in heavy commercial and off-highway vehicles because of its cost-effectiveness, reliability, and load carrying capacity. However, the use of this type of power distribution box increases the number as well as the size of cables, which in turn increases the overall weight of the vehicle. The increase in vehicle weight is a major problem for the manufacturers of vehicle power distribution box. The market for commercial vehicles is growing at a significant rate. The rapid development of infrastructure, especially in countries such as China and India, is supporting the growth of the commercial vehicle market. According to the Department of Statistics, Stanford University, spending on infrastructure development in China increased by almost 50% from 2015 to 2016. Increasing investments in infrastructure have propelled the demand for HCVs. Also, the growing demand for freight transportation is driving the market for HCVs. Leoni presented the next generation of its modular system for high-voltage power distribution in electric and hybrid vehicles at the IAA International Motor Show in Frankfurt. The further-developed Y-splitter is more variable, lighter, and less expensive than comparable products. Littelfuse added two new power distribution products to its commercial vehicle products offering. The new products, HWB6 and HWB12, complement the existing product family with the addition of two more compact options to their wide variety of rugged vehicle electrical modules. The HWB family is ideal for accessory circuits, overflow circuits, and can even be used as a main unit on smaller vehicles. Eaton announced its long-term commitment to be present and serve the Israel market through the establishment of Eaton Israel. The company will operate through two sites—a sales, marketing, and support center in Ra'anana and a logistics and distribution center in Ashdod. The products and services offered in Israel include power distribution, energy storage, industrial automation, and data center solutions, as well as life safety products for fire detection, emergency notification, and safe evacuation including adaptive emergency lighting systems. The company aims to double its sales in Israel over the next three years. Yazaki expanded its operations in Texas to include manufacturing of dealer parts and service components and established a manufacturing development center for engineering. The facility, located in El Paso, produces parts for services such as fuse boxes, electronic modules, and remote keyless entry systems. Column switches, electric vehicle charge couplers, and instrument panel clusters will also be produced at the facility. 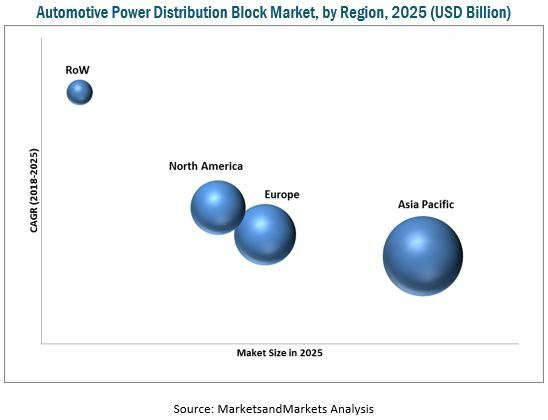 The automotive power distribution block market is projected to grow at a CAGR of 4.15% from 2018 to 2025. The market is estimated to be USD 6.47 billion in 2018 and is projected to reach USD 8.60 billion by 2025. The market growth can be attributed to the increasing adoption of vehicle electronic functions that require a reliable, flexible, robust, and efficient power distribution system. The configurable power distribution box is estimated to be the fastest growing segment of automotive power distribution block market. The configurable power distribution box combines fuses, relays, microcontrollers, and multiple (circuit board and fret) layers of interconnections into a single integrated assembly to distribute power for different applications. Also, this type of a power distribution box is more suitable for a complex electronic control system. By vehicle type, the passenger car segment is estimated to hold the largest share of the automotive power distribution block market. The rise in the production of passenger cars globally, increasing demand for premium vehicles and SUVs, and increasing preference for high-performance personal vehicles are fueling the growth of the passenger car market. Also, the global demand for passenger cars is higher than that for commercial vehicles and is expected to grow further in the future. Additionally, factors such as the sizeable number of luxury light-duty vehicles in Europe and North America and the increasing demand for these vehicles in the Asia Pacific region are increasing the demand for automotive power distribution block in this vehicle segment. The automotive power distribution block market for Battery Electric Vehicles (BEVs) segment is estimated to be the fastest growing market. Factors such as strict emission norms by the government, the rise in ecological imbalance due to excessive carbon emission, and less energy consumption are promoting the growth of BEVs. By off-highway vehicle type, the construction equipment is estimated to be the fastest growing segment of automotive power distribution block market. Rapid development of infrastructure, especially in countries such as China and India, is supporting the growth of this market. The Asia Pacific region is estimated to dominate the automotive power distribution block market for automotive, by volume as well as value. The growth of this market can be attributed to the increase in production and demand for passenger cars and electric vehicles. Also, the increasing adoption of advanced cockpit electronic functions in vehicles, growing purchasing power of the population, and increasing consumer awareness for safety features in developing countries are the key factors driving the market in the Asia Pacific region. A key factor restraining the growth of the automotive power distribution block market is the lack of technological innovation in power distribution box. A hardwired power distribution box is cost-effective but requires more space and adds to the overall weight of the vehicle. On the other hand, a configurable power distribution box reduces the number of fuses and other components and thus helps in reducing the overall weight of the vehicle. However, the cost of this type of a power distribution box is higher than a hardwired power distribution box. Manufacturers should offer a solution that can meet both requirements i.e. weight reduction and cost-effective system. Some of the key market players are Eaton (Ireland), Lear (US), Sumitomo Electric (Japan), TE Connectivity (Switzerland), Yazaki (Japan), and Littelfuse (US). In today’s market, components are much cheaper, technology has improved considerably, and several mechanically-operated systems and components are being converted to electrical to reduce the weight of the vehicle. For instance, the use of an electric power steering over hydraulic power steering leads to a saving of 2 to 4% in the fuel consumption of a vehicle. Also, OEMs have started offering premium features in their mid-segment vehicles to differentiate themselves from the competitors. Some of these features are ambiance lighting, powered sunroof, powered tailgate, digital instrument clusters, and infotainment systems. With increasing demand, these features would become a standard offering for the mid-segment vehicles. Moreover, the advent of semi-autonomous and autonomous vehicles has fueled the use of ADAS features in all variants of vehicles. The use of ADAS features leads to an increase in vehicle electrification, which in turn requires more power supply. The increased need for power compels manufacturers to increase the number of components and size of the power distribution box, which in turn increases the complexity in the design of the power distribution box. The increased complexity in the design of the power distribution box is the major challenge for vehicle power distribution manufacturers. Sumitomo and NEC Corporation collaborated for the development and planning of automotive components in the mobility business segment. With this development, the companies plan to develop and demonstrate software and hardware for transportation and in-vehicle infrastructure. The companies will exploit the provisions of artificial intelligence and internet of things (IoT) technologies in cascading effect. Sumitomo and GoMentum Station entered into a partnership to develop autonomous and connected vehicle technologies. This move would help introduce advanced automated vehicle technology by utilizing the resources of GoMentum Station. Littelfuse successfully acquired the circuit protection business of TE Connectivity for USD 350 million. After the acquisition, Littelfuse strengthened its core circuit protection business by adding new products and new markets from TE connectivity. Littelfuse acquired the assets of JRS MFG. LTD., headquartered in Winnipeg, Manitoba, Canada. JRS MFG. LTD. provides custom engineered and manufactured products for the electrical industry with a primary focus on the mining and utility markets.